The two important cities each had perhaps 35,000 people at their peak period. 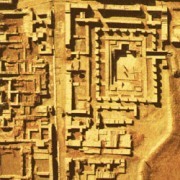 These cities had features which made them unique included brick and had well-planned streets, pottery drainage ditches, large granaries, and a large bath for ritual cleansing. Kalibangan is a town situated in Hanumangarh district of Rajasthan. It’s located on the banks of River Ghaggar. Kalibangan is the third important city of Indus valley civilization. The city had received its name from the innumerable pieces of terracotta bangles that were excavated there. Dholavira is an archaeological site in Kutch District of Gujarat that contains ruins of an ancient Indus Valley Civilization. 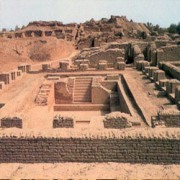 It is one of the five largest Harappan sites. Rupar, is a city of Punjab. It is also one of the bigger sites belonging to the Indus Valley Civilization. Rakhigarhi is a village in Hisar District in Haryana. It was the site of an extensive city and part of the Indus Valley Civilization. Lothal in Gujarat is one of the most prominent cities of the Indus valley civilisation. The findings consist of a dock that makes Lothal the world's earliest known port towns. It was a thriving trade centre during Indus civilization. Ganeriwala is situated on the dry river of Ghaggar now a part of vast desert. It is spread over 80 hectares and is the largest sites of the Indus Valley Civilization. It is not excavated yet and is only identified. Aror is located 8 km east of Rohri in present day Sindh, Pakistan. It had served as the ancient capital of Sindh and was once located on the banks of Indus River. The city was once the prime centre of commerce and trade. Agroha is an ancient town in Hisar district of Haryana. It is an Indus Valley Civilization archeological site. Ancient structures, pot-shards, coins and seals have been found in archaeological excavations there. Kannauj, a district of Uttar Pradesh is of immense historical significance in ancient India. In ancient texts it is described as "a city which raised its head to the skies and which in strength and beauty might boast of being unrivalled." Bairatis is located 52 km north of Jaipur in Rajasthan. It’s was a celebrated town in ancient India. Sagalais, the modern day Sialkot, in Pakistan, once served as a great centre of trade and commerce. Sravasti located in the Gonda district of Uttar Pradesh is associated with Buddhism. This ancient Indian city is known to shelter Buddha for 24 rainy seasons at the Jetvana Gardens. Sitanagaram is a small ancient site located in the Guntur district in Andhra Pradesh. It was an ancient Vedic City. The place is related to the ancient history of Ramayana during the last Treta Yuga. Hansi is an ancient city currently in the Hisar district of Haryana. This city is known to possess five gates to enter Delhi where from any of its gates altitude increases gradually as one enters Delhi city. Kumbhojis is the name of an ancient town located in the Kolhapur district of Maharashtra. Kalpiis is located in Jalaun district of Uttar Pradesh. It is conceived as the birthplace of sage VedVyasa, who authored Mahabharata. Bhinmal is a town in the Jalore district of Rajasthan, once served as the capital of ancient Gujarat. Tamraliptais identified as Tamluk is yet another ancient city, presently coming under West Bengal. Urayur in Tamil stands for "the residence" is a city located in Tiruchirappalli district of Tamil Nadu. Dwaraka, the ancient city, is situated in Gujarat. It’s considered in Hindu mythology as the dwelling place of Lord Krishna. Bayana is a town in Bharatpur district of Rajasthan. It was known in ancient India as Sripatha or Sriprashtha or Shantipura. Chunar, located in the Mirzapur District of Uttar Pradesh was well-known town in ancient India. Ujjain is located on the banks of river Shipra in Madhya Pradesh. The ancient city gained prominence because river Shipra has a important place in Hindu mythology. Osian is an ancient city located 65 km from Jodhpur. It considered as an oasis amidst the desert of Rajasthan. Sopara- was an ancient port town located in Thane district of Maharashtra. This town flourished from the 3rd century BC to the 9th century AD. The finding of the relics in a stupa and the rock edicts of Ashoka in 1882 prove the importance of this port town. Kurukshetra located in Haryana was an important place as the War of Mahabharata was fought here and during the time of war Bhagavad Gita was preached there. Vallabhi s an ancient city located in Saurashtra in Gujarat. It was the capital of the ancient Maitraka dynasty. Kalinjar is a fortress-city is located in Banda district of Uttar Pradesh. The fortress contains several temples, dating as far back as the Gupta dynasty of the 3rd-5th centuries. It served several of Bundelkhand's ruling dynasties. Tirunelveli in Tamil Nadu is an ancient settlement. It was a seat of rule of the early Pandyas, the medieval and later Cholas, the later Pandyas, the Ma'bar and Tirunelveli sultanates. Ayodhya is situated adjacent to Faizabad city in Uttar Pradesh. It is also known as Saket. This ancient city is believed to be the birthplace of the Lord Vishnu’s avatar Rama, and setting of the epic Ramayana. Swat is in the present-day Khyber Pakhtunkhwa region of Pakistan. It is thought to be the probable birthplace of Vajrayana Buddhism. Kaushambi is one of the districts of Uttar Pradesh. In ancient India it was the capital of the Vatsa Mahajanapada, one of the 16 such states. Taxila is a town and an important archaeological site in Rawalpindi; Pakistan. The city dates back to the Gandhara period and contains the ruins of the Gandhāran city of Takshashila which was an important Hindu and Buddhist centre. Tilaurakot archaeological site in Nepal is identified as a possible location for Kapilavastu. It is widely accepted that Buddha spent the first 29 years of his life in the vicinity of Kapilavastu. Lumbinī is located in the Rupandehi district of Nepal. It is largely regarded as the birth place of Gautama Buddhha. Kushinagar is a town in Kushinagar district of Uttar Pradesh. It’s where Gautama Buddha died. Sarnath is located 13 kilometres from Varanasi, in Uttar Pradesh. It’s where Gautama Buddha first taught the Dharma, and where the Buddhist Sangha came into existence. Sankassa is now identified to be in Farrukhabad district of Uttar Pradesh. The city came into prominence at the time of Gautama Buddha. King Ashoka developed this place and installed one of his famous Pillars. He also built a stupa and a temple commemorating the visit of the Buddha. Nalanda is located in Bihar and was an ancient centre of higher learning from the fifth century AD to 1197 AD. Varanasi is a city on the banks of the river Ganga in Uttar Pradesh. Varanasi is the oldest living city on earth. In ancient India it was the city of learning. Scholarly books have been written in the city, including the Ramcharitmanas of Tulsidas. Mathura is a city in Uttar Pradesh. It’s associated with the birthplace of Lord Krishna. Mahabharata and Bhagavata Purana epics, tells that Mathura was the capital of the Surasena Kingdom, ruled by Kansa, the maternal uncle of Shri Krishna. During the ancient India, Mathura was an economic hub as it was located at the junction of important caravan routes. Vaishali was an ancient city located in current Vaishali District, Bihar. It was the capital city of the Licchavi, one of the world's first republics during mahajanapada period, in the 6th century BC. It was here the 24th Jain Tirthankara Mahavira was born in 599 BC. At Vaishali, Buddha preached his last sermon before his death in 483 BC. The modern-day Patna was in ancient India known as Pataliputra. It was originally built by Ajatashatru in 490 BC. It became the capital of the ancient Mahājanapadas kingdom of Magadha and served as the seat of power of the Murya and the Gupta empires. Bairat is in Jaipur district of Rajasthan. Its history goes back to the time of Mahajanapada (kingdom) when it served as the capital of Machcha or Matsya. It also finds mention in the Mahabharata. (Kannauj)- Kannauj is in Uttar Pradesh. Kannauj is an ancient city, in earlier times the capital of emperor Harshavardhan. It was called Calinipaxa during reign of Alexander.